Prolific Works’ on-site Group Giveaways allow authors to work together to promote their books on one landing page. Authors can search for and submit their books to Group Giveaways right on Prolific Works! The Organizer of the Group Giveaway then reviews the book submissions and accepts the books they would like to include on the landing page. When the Group Giveaway launches, each member of the Author Team can share their personalized link with readers to maximize their outreach and start finding more of the right readers. Readers with the landing page link can choose to download any of the books featured in the Group Giveaway. As the member of an Author Team, you are responsible for sharing the Group Giveaway and maximizing the outreach of the promotion. To get involved, you can browse the available Group Giveaways! From the Group Giveaway Dashboard, click "Join a Group Giveaway". From here, selecting a book will filter the available Group Giveaways based on relevance to the genres of your book. Click the "Select" button underneath the book of your choice to see the most relevant Group Giveaways! 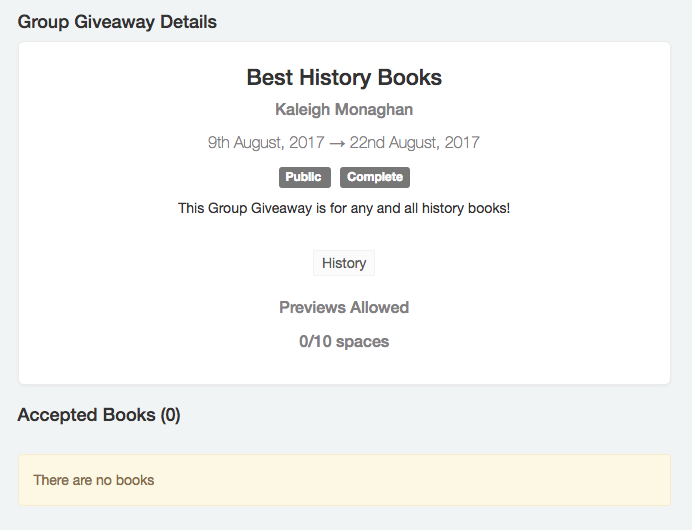 If you don’t want to browse the available Group Giveaways by selecting a book, you also have the option of browsing by genre. Just scroll down and click “Browse” to filter by genre. Any genre with a teal “Select” button has at least one available Group Giveaway. Click that button to look at the Group Giveaways in that genre! Once you select a book or genre, a list of the current Group Giveaways will be displayed on the page. Group Giveaways are ranked by their relevance to your selected book, so Group Giveaways in closely related genres to your book are displayed first. If you think you might be interested in joining one of the Group Giveaways you see, click “View Details” on the far right side of the Group Giveaway. Note: You may see a blue verified badge next to the name of the Group Giveaway Organizer while browsing. This badge denotes that the Organizer is a Verified Organizer. You can learn more about Verified Organizers here. You can tell Instafreebie to notify you via email when a new, public Group Giveaway is created in any genre of your choice. Click the gray bell in the upper right-hand corner of any genre to receive notifications. As long as the bell is blue, you’ll receive an email notification any time a new, public Group Giveaway is created in that genre! You can learn more about genre alerts by clicking on the “Get Alerts” button in the top right. If you would like to receive genre notifications only when a Verified Organizer creates a Group Giveaway in your selected genres, turn this switch on. When this option is off, you will receive email notifications for all new, public Group Giveaways in your selected genres. You can learn more about Verified Organizers in our Verified Organizer FAQ. From the Group Giveaway Details page, you’ll be able to see information about the promotion including the dates, genres, and a description from the Organizer. You’ll also be able to see if any books have been accepted yet. The above Group Giveaway has two tags: Public and Complete. A Group Giveaway will have a combination of the following tags depending upon its status and requirements. Public: Any author on the Instafreebie site can find and join this Group Giveaway. This Group Giveaway can be found under the "Join a Giveaway" and "Current Giveaways by Genre" sections of the Group Giveaway Dashboard. Private: Authors on the Instafreebie site cannot find or join this Group Giveaway. In order to add books to this giveaway, the Group Giveaway Organizer will either submit Instafreebie giveaway links manually or send specific authors a link to the Group Giveaway Details Page. Draft: This Group Giveaway has not started yet. The Group Giveaway Organizer may still be accepting submissions. The Group Giveaway landing page will be live on the dates specified above this tag. Live: This Group Giveaway is currently in progress. Authors are no longer able to join this Group Giveaway. Complete: This Group Giveaway has been completed. Authors are no longer able to join this Group Giveaway. Giveaways Will Be Optional Opt-in: This tag only applies to Group Giveaways that are created by a Verified Organizer. All giveaways in this Group Giveaway must be optional opt-in. Prolific Works will automatically create a optional opt-in giveaway for a book when it is accepted into this Group Giveaway. Giveaways Will Be No Opt-in: This tag only applies to Group Giveaways that are created by a Verified Organizer. All giveaways in this Group Giveaway must have no opt-in. Prolific Works will automatically create giveaway without opt-in for a book when it is accepted into this Group Giveaway. Optional Organizer List Opt-in: This tag only applies to Group Giveaways that are created by a Verified Organizer. Readers who download books from this Group Giveaway will be given the option to subscribe to the Verified Organizer's mailing list. No Organizer List Opt-in: This tag only applies to Group Giveaways that are created by a Verified Organizer. Readers who download books from this Group Giveaway will never be subscribed to the Verified Organizer's mailing list. If you would like to submit your book to this Group Giveaway, click “Join this Group Giveaway” on the right side of the Details page. 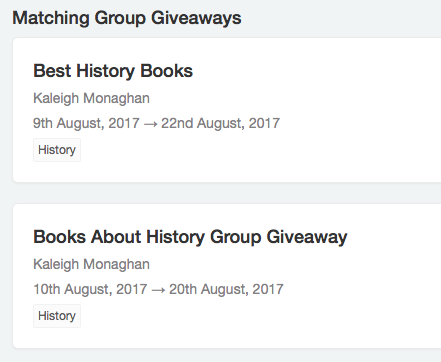 From the resulting pop-up, you can search through your books and confirm which one you’d like to submit to the Group Giveaway. Note: You will not be able to select a book you have already submitted to this Group Giveaway. Once you select the book, send a message to the Organizer. You can tell them a little about yourself, your book, or why you think your book is a good fit for their Group Giveaway! When you’re satisfied with your book selection and message, click “Join” to submit to the Group Giveaway. You will receive an email notification when the Organizer accepts or denies your book. Note: If your book is accepted to a Group Giveaway, a new public, optional opt-in giveaway campaign link will be generated for use in the Group Giveaway. This giveaway campaign will be named after the Group Giveaway and displayed along with any other giveaways you’ve created for this book. Once you submit your book to a Group Giveaway, you will be prompted to write a blurb for a fellow author! You can learn more about how to write blurbs here. Use the comments section on the Group Giveaway Details page to communicate with the Author Team. Any comments you make will be public to anyone who views the Details page. Check the box to receive email updates if you’d like to be notified in your inbox when anyone else comments on the Group Giveaway. All members of a Group Giveaway Author Team have a personalized sharing link, which can be found in the top right of the Details page under the heading, “Your Group Giveaway Sharing Link”. Copy this link and share it to your newsletter, on your blog, on social media, or anywhere else there may be engaged, interested readers. You should share your Group Giveaway with readers as much as possible once it goes live! Group Giveaways are the most successful when all involved authors are actively sharing the landing page throughout the entire duration of the promotion.